Money exchange can be performed at Bangui-M'poko Airport. A lounge is available in the departure hall. Access is restricted to business or first class travelers of some airlines and to holders of VIP lounges cards. Access is also possible by paying a one time 5000FCFA fee (~US$8). The Central African Republic has several 3G operators (Orange, Telecel, Moov) selling SIM cards without subscription and 3G/4G USB sticks for a cheap and fast internet access on your PC, tablet or phone. These SIM cards are available and can be activated anywhere in Bangui. To send letters, postcards and parcels, for purchases of stamps and for receiving and sending money orders, the post office of Bangui-M'poko Airport is open from monday to saturday, from 8AM to 5PM. Bangui Intl. Airport is always concerned about the safety of passengers and aircraft. The police of the airport listen to all travelers. Security officers also ensure compliance with international standards. You can call them to report any suspicious activity. In addition, we remind you that leaving luggage unattended can cause its destruction and prosecution against you. 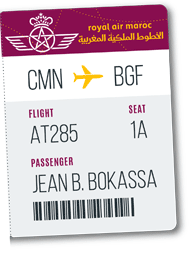 Each airline flying to the Central African Republic impose a different baggage allowance. It is important that every traveler comply with those rules under threat of being required to pay excess baggage fees that can be prohibitive. It is therefore recommended to weigh your luggage before you get to the airport. However, it is possible to weigh them on the balances available at check-in counters in order to lighten them if necessary. Passengers who have not had the time to buy their tickets or have missed their flights have the option to purchase a ticket at the airport (at generally higher rates).